Let me confess to a moment of cynicism. When I first heard of the Africa Bible Commentary project, I thought "oh please - another expression of post-modern reality fragmentation. We already have plenty of Australians, Americans and Europeans ignoring the Bible's own assertions, reading their own situation into it, and then admiring their own reflections and proclaiming it as the word of God - do we have to make the Africans do the same?" I'm glad to discover how wrong I was. 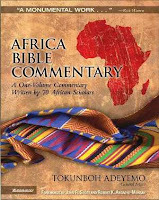 Conrad Mbewe, a Reformed Baptist from Zambia, has written an excellent review of the Africa Bible Commentary. He commends it as being an excellent example of "conservative evangelical scholarship" where "the commentators allowed the passages they were commenting on to speak for themselves – however uncomfortable that might be – which is an important aspect of conservative evangelicalism." Nevertheless, the commentary is appropriately contextuslised for Africa: "All the books of the Bible, from Genesis to Revelation, are made to speak to us as Africans", including articles on "HIV and AIDS, funerals, circumcision, street children, inheritance of widows, witchcraft and demons, lobola, tribalism, polygamy, land, debts, etc., [which] will not be found in your average commentary from the West (or the East) but they are all handled in this one volume." This bolsters my hopes for the still-in-progress South Asia Bible Commentary. I was born in Sri Lanka and still have family and friends there. I hope this lastest project will equip people in the sub-continent, and expats like myself who seek to minister to South Asians who in the West. We give it to our students at MBTI in either English or French - and it is for free if they complete two subjects. There's also a work underway to translate it into Malagasy for the Madagascans.